The thing about a SELF LOVE practice is that you get to be in charge of how it unfolds. You can’t get it wrong or screw it up. You just keep practicing. Everything improves with practice. 30 years ago I taught myself calligraphy by practicing every day for a few hours as I rode the ferry boat home from my job in NYC. And I got good at it. Good enough to create a lucrative small business that I was able to do when my children where growing up. There are many benefits to the practice of self love. With self love in play, you can be free from victimhood to any situation, circumstance or relationship. During every interaction or encounter you gain the skill to look with different eyes and see more clearly what is real. The idea is to feel good. Okay, I’ll admit clarity can sometimes be annoying in it’s eye-opening way. Being awake and aware shows you many new things. It can sometimes feel like a heavy brick flung at your somewhat hard head. But the gentler you become with yourself (this happens thru your practice), the more you observe without judgment what is really true. I share with you my own experience as I consistently and continually work on noticing the role I am playing in a situation. I notice what part I own, what belongs to me and what doesn’t. Sometimes I feel like crap (that’s a sure sign that I’m off my path) and so I get back on it when I am ready. This practice and awareness is what gives me immense power in my life. I used to live a life of “Why would they do that to me?” and “How could you do such a thing to me? It would drive me nuts to try and understand why people did what they did and why I was hurt over it. You know the kinda crap I’m referring to. The kind that makes you feel like crap. The kind that give you no control. The kind that serves no one and that ends you feeling miserable, unlovable and not enough. It’s much easier to change your own thoughts, your own actions, your SELF. And quite impossible of you to expect to change someone else. Seriously it will never happen. They won’t change for you or because of you. Expecting someone else to change is a set up for disappointment. The sooner you embrace that idea that Self love is the answer to the change you desire, the more power-filled you become. Self love is the ultimate life changer. Once you have a practice going, everything in your life will feel and look better. I promise. It goes like that. So if you are feeling a little or a lot like a victim, no matter what circumstance or what person is causing you to feel angst, I invite you to indulge in a massive dose of extreme self love and extraordinary self care. Here are 3 steps that you can walk into right now that will put your directly on the path to self love. 1) Lose the fake stuff and get real. Make a daily game out of your meals. How much of your meal can you make healthier, real and naked (food in it’s own natural form)? Ask yourSelf at every meal, “Is this the most loving thing I can feed myself?” At first this may taste weird, but with practice your body will change for the better. 2) Become less interested in why you can’t. Make a daily game out of your words. Can you catch the times you’re trash talking about how you can’t do something? Stop it. Don’t speak those words. If you start to think these thoughts about yourSelf, notice the thought, and let if flow by. Then replace it with a new idea. At first this will sound weird, but with practice your thoughts will change for the better. Can you get real with yourself? Before jumping in the shower, can you stand in front of the mirror and look at it? Can you say “HELLO GORGEOUS” followed by one nice compliment to and about yourself? You CAN find something ! Your hair, your eyes, your lips. Pick that thing and focus only on that one thing. Leave the rest alone. At first this may feel weird and different but with practice you will feel better and better. 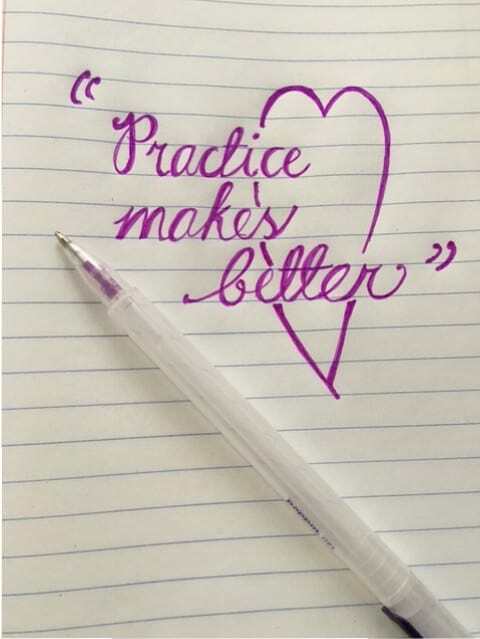 Let me know how your PRACTICE MAKES BETTER and post your comment below.